Hyperbole, documentation errors, mistakes, accepted norm at Auctionata. Analysis of statements, interviews, press releases by Auctionata CEO Alexander Zacke and international managing director Ben Hartley, coupled with review of Terms & Conditions exclusions that void 25-year-Auctionata guarantee demonstrate hyperbole, exaggeration, errors and omissions are routine at Auctionata. It appears the majority of Auctionata communication is simply regurgitated, becoming in essence, journalistic propaganda, accepted without equivocation by the American Press, including: Forbes, Skates, The New York Times, Luxury Daily, e-commerce bytes. In contrast, the German press, including Der Standard, Wirtschaftsblatt and The Wall Street Journal (German edition) appear more critical and apprehensive, challenging the viability of Auctionata's investment to build a 5,000 foot New York TV studio. Alexander Zacke and Ben Hartley acknowledge the importance of establishing consumer trust. Establishing trust is an uphill battle as collectors, especially knowledgeable ones, repeatedly observe factual untruths, erroneous and misleading comparisons, blatant counterfeits, missing provenance, documentation errors, flawed condition reports, all allegedly sanctioned by freelance, paid by the minute, "experts". And bizarrely, Terms & Conditions loopholes in the widely touted 25 year Auctionata Guarantee indicate claims won't be accepted for lots with errors and omissions; well, that's an enormous amount of lots. Perhaps Auctionata should re-draft its guarantee to ensure it is NOT meaningless and useless. Are Auctionata Investors aware of the consistent negative customer reviews, aside from 5 stars awarded by CEO Alexander Zacke, which skew towards one star at Yelp, Trustpilot, Ripoffreport, Reseller Ratings, indicating buyers and consignors are universally dissatisfied with auctionata's poor/ineffective services, warning auctionata's condition reports are not objective, but worse, inaccurate and incomplete. The website mentions "buyer protection", however, user reviews indicate Auctionata failed to remedy errors and mistakes. It is inconceivable Auctionata Investors would agree the New York expansion is so successful, they cannot wait to burn more cash by duplicating the 5,000 foot TV studio and branch office in Hong Kong and elsewhere. What is Auctionata management doing to improve massive unsold lot rates inconsistent with the alleged 70% sold through rate communicated to the press. In 2014, according to data available at Live Auctioneers, the Unsold rate was 41.2% for the 12,091 lots offered at Auctionata AG and Auctionata Inc. Try to get that same information at Auctionata, and learn that level of transparency is unavailable. The Unsold lot rate for New York auctions since October 2014 is much worse, 58.8%, and some NY suctions, like African & Oceanic Art, where ONLY 6 lots sold, exceed 90% unsold. Clearly, Auctionata management has not been objective about its poor New York performance. Why does investor Sylwester Janik think Auctionata is an excellent example of what to look for now that Series C funding has reached $95 million. Recently Auctionata announced it had closed €42m Series C funding, led by Warsaw's MCI Management and joined by London’s Kreos Capital, New York's Hearst Ventures and Hong Kong's Yuan Capital. Does Alexander Zacke REALLY believe all art appreciates? Alexander Zacke states "Art is Not Only Stable but Safe", 2014 Interview, Auctionata Magazine "Art is not only a stable, but also a safe, investment. By safe, I mean that afterwards, the item has appreciated in value. Art is therefore a long-term, stable and safe investment." CEO Alexander Zacke may be new to the corporate world, but that doesn't excuse irresponsibility. We are surprised CEO Alexander Zacke doesn't realize it's unethical to guarantee art as a stable and safe financial investment, especially since the majority of art sold on Auctionata is not collectible. 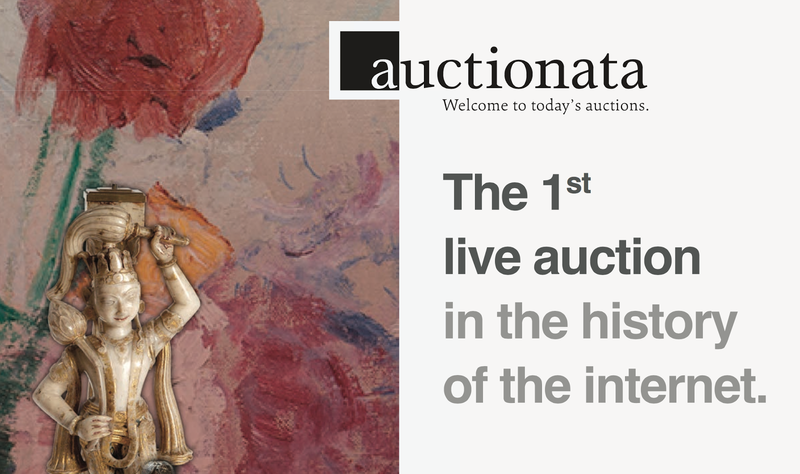 For reference, according to data on Live Auctioneers, 41.7% 2014 sold Auctionata auction lots were under €2,000, contrary to the company's statement that most lots sell between $5,000 and $20,000. Was Auctionata fastest growing German Company as Alexander Zacke stated in 2013 IDCEE speech? Alexander Zacke mistakes facts in 2013 IDCEE speech: "Auctionata is probably the fastest growing company in the world and GMV (Gross Merchandise Volume) currently grows +6.5% per week, and has done so for the the past 12 consecutive months." Auctionata does NOT rank among top 25 fastest growing Internet companies according to Informalo. The Next Web confirms Auctionata didn't make the list of top 5 fastest growing German companies either. The American press, including Forbes, Skates and Private Investors seemingly have an unexplained love affair with Alexander Zacke and mostly regurgitate company statements and press releases, without equivocation. It is also surprising American press has accepted without challenge the 2014 Auctionata press release announcing record sales of €31.5 million, which Auctionata claims converts to an astonishing $41 million; put aside the nearly 30% premium, NO specific source of revenue was provided, nor is there any transparent detail on the Auctionata website either. In contrast, the German Press including Der Standard, Wirtschaftsblatt and Wall Street Journal (German edition), is sharply more critical about Alexander Zacke and the 1995 Asian art scandal at Dorotheum that came to light shortly after Mr. Zacke's departure. The German Press is evasive as to why Alexander Zacke left his full time job at Dorotheum in 1995 as department head of Asian art and fails to provide specifics about the consignment sources largely responsible for the sudden increase in Asian art volume at Dorotheum during Zacke's tenure. Alexander Zacke states on linkedin: " I took over their Asian Art department with an annual sales level of 1 million ATS. When I left the company four years later, annual sales were at 45 million ATS." The German press is circumspect regarding conflict of interest accusations with respect to Asian Art consignments from Mr. Zacke's family during his tenure as Asian Art department head, stating "no one is willing to talk about it on record". Von Marcus Pfeil, technology reporter The Wall Street Journal doesn't hold back providing alarming perspective on a 6/21/13 report about the Dorotheum Asian art scandal: "Speculation is Alexander Zacke was embroiled in the 1997 Asian scandal at the Vienna based Dorotheum. The renowned auction house then auctioned incorrectly attributed objects. 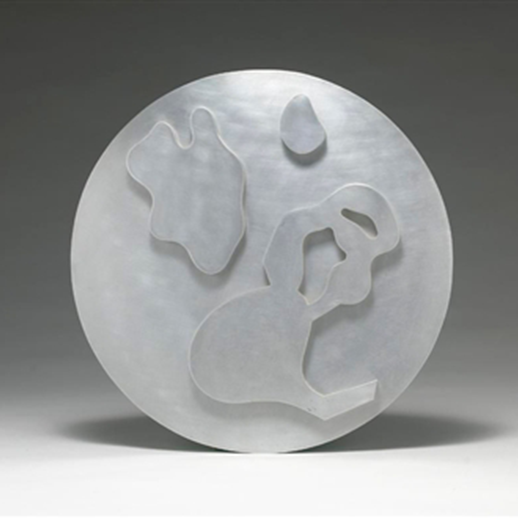 Although Zacke worked as an Asian expert at Dorotheum from 1990 to 1995. Later, however, it turned out that some of the wrongly attributed artifacts had been auctioned in 1995, during Zacke's time at Dorotheum - coming from Galerie Zacke." "Most of those who were involved at the time, do not want to talk. A former Dorotheum executive only says they had all made mistakes, Zacke's successor at Dorotheum declined to speak on the phone, and a renowned Asian expert who for years did business, with the Zacke's, even says she was afraid of this family." "Perhaps this man is just looking for a second chance. As of today, he has not been found guilty of a crime anyway. Otherwise we would not have invested in Auctionata" says Lars von Holtzbrinck Ventures Langusch. 15.5 million euros has been collected by the venture capitalists Holtzbrinck, Bright Capital, Kite Ventures, Otto eVentures and starting this year, Earlybird wave." There were more than 30 dealers selling art on eBay in 1999.
eBay launched in 1995, and Alexander Zacke's recollection is wrong; there were far more than 30 dealers selling fine art on eBay in 1999, Joseph K. Levene, author of The Fine Art Blog, and President of Joseph K. Levene Fine Art, Ltd., began selling on eBay in 1999. Joseph K. Levene Fine Art, Ltd., was an original Sothebys.com fine art charter member, one of 2,000 art dealers in the United States and Europe, among a select group chosen to also sell on eBay during the first Sotheby's/eBay partnership. Alexander Zacke boasts "Auctionata has largest network of renowned experts who value, authenticate & curate art"
Auctionata "experts" are freelance employees paid by the minute via PayPal. Full time commitments by the team of 200 to 250 Auctionata freelance "experts" is highly problematic for several reasons. Relying on freelance experts is a marketing and legal liability; in addition, although Auctionata clearly states its valuations are NOT appraisals and each lot is authenticated and checked, there is an unusually high degree of counterfeits sold. Being freelance may explain why so many Auctionata lots contain errors, inaccurate or vague condition reports, erroneous and misleading comparisons that reference irrelevant price comparisons, all without specifics and NONE linked. Auctionata experts are paid by the minute via PayPal; states Alexander Zacke: "our experts are paid fixed-fee based on the number of minutes they spent on the case. That payment is done automatically and is processed into their PayPal accounts. If the item goes to auction, then they will also receive a commission." Conflicts of interest by the freelance expert team is a serious issue, especially for consignors who want to ensure valuations are NOT biased. Many "experts" have full time jobs and/or own/represent competing businesses selling/involved with similar items they evaluate part-time for Auctionata. Several high ranking Experts own full time businesses, some online too, which compete with Auctionata. Of course, the names of the business are withheld on the CV's posted on Auctionata, but visible on Google and linkedin. For reference, neither Christie's, Sotheby's nor frankly, any legitimate auction house or gallery would ever tolerate employees with side businesses, yet this a conflict of interest that has serious implications and is a scandal waiting to happen. Do experts recuse themselves if they have previously dealt with a consignor at THEIR business? What is the review procedure for lots documented by its freelance"expert" team and what happens to experts who have a high incidence of making errors and listing counterfeits? Do Auctionata experts self consign material and/or does a third party get involved? Lack of experience is a serious concern with Auctionata experts and department employees given the extent of mistakes which are common in their listings; many "experts" are 2014/15 attendees of appraisal programs offered by Sotheby's, Christie's, etc. What steps does Auctionata take to ensure its experts are not convicted felons; involved in fraudulent activities? After all a former Auctionata expert was convicted of fraud and is no longer employed by Auctionata. Auctionata should engage a neutral consultant to identify the numerous counterfeit artworks sold to date, and take pro-active action to inform their buyers and offer the opportunity to refund the sale, including payment of shipping. Freelance "experts" get commission based incentive IF respective lot consigned & sold. Paradoxically, Auctionata pays experts by the minute, but if customers request valuations for over 5 items, Auctionata sometimes imposes value based fees, considered unprofessional and unethical. Furthermore, although the website states valuations are free, in other areas of the website it states that only the first 5 valuations are free. Why the double talk? The American Appraisers association warns against value based fees and states: using the results of the appraiser’s undertaking might well suspect that these results were biased and self-serving. 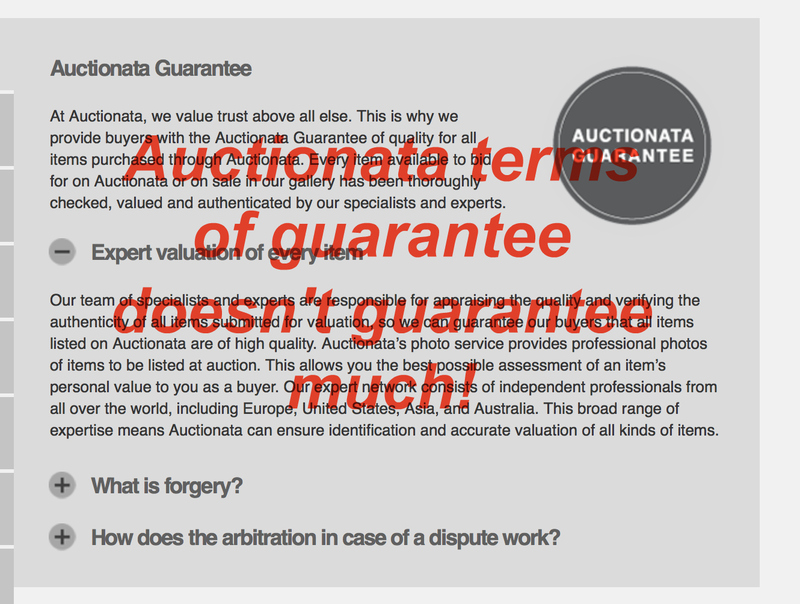 Auctionata terms of guarantee doesn't guarantee much. Is every lot really guaranteed for 25 years at Auctionata? For the answer, you need to review over 17K words in the Terms & Conditions section of the Auctionata guarantee. For comprehension, word recommends a college education but legal counsel is more appropriate. The Terms & Conditions section is alarmingly confusing, particularly when you realize Auctionata has two different terms & conditions sections, one for Auctionata AG, the German Auctionata, and another for Auctionata, Inc. the US company. Review both terms & conditions and you will be more confused once you read the extensive list of exclusions that VOID guarantee coverage for the advertised 25 years. Auctionata AG Guarantee fine print states: Please note that this website allows you to purchase goods from Auctionata AG or Auctionata, Inc. - a wholly owned US subsidiary of Auctionata AG. Both organizations operate with a different limited sarranty. The Auctionata guarantee below apply for all purchases of goods at auction or via the online shop in which Auctionata, Inc. acts as the seller. For all purchases of goods at auction or via the online shop in which Auctionata AG acts as the seller, this Auctionata Guarantee apply. Why does Auctionata AG claim there is a 25 year guarantee on all lots when the Terms & conditions stipulates coverage is ONLY VALID when conducted by an AUCTIONATA EMPLOYEE. Auctionata employees NEVER provide valuations only the freelance experts, yet the Auctionata AG Terms & Conditions states the guarantee only applies if employees do valuations. Auctionata AG Terms & Conditions EXCLUDES any lot designated as museum copy which would apply to any lot designated as an "after". If buyers don't read the Auctionata AG terms & conditions fine print, the website does little to ensure buyers realize all lots documented as AFTER, MUSEUM COPY and/or REPRODUCTION are excluded from the 25 year guarantee. 11.2 If a catalogue description explicitly refers to an item as a “copy” (e.g. as a “museum copy”), then the item in question will be deemed purchased as a copy and not as an original, and will thus not be covered by the Auctionata guarantee in this respect. Likewise, if the catalogue description explicitly describes or designates an item as being "of doubtful authenticity", then said item will be deemed purchased not as an original but as an “item of doubtful authenticity” and will thus not be covered by the Auctionata guarantee in this respect. Stating ALL LOTS covered by 25 Year Auctionata Guarantee is DECEPTIVE. Why does Auctionata AG falsely state every item is AUTHENTICATED when numerous lots are EXCLUDED from any guarantee. 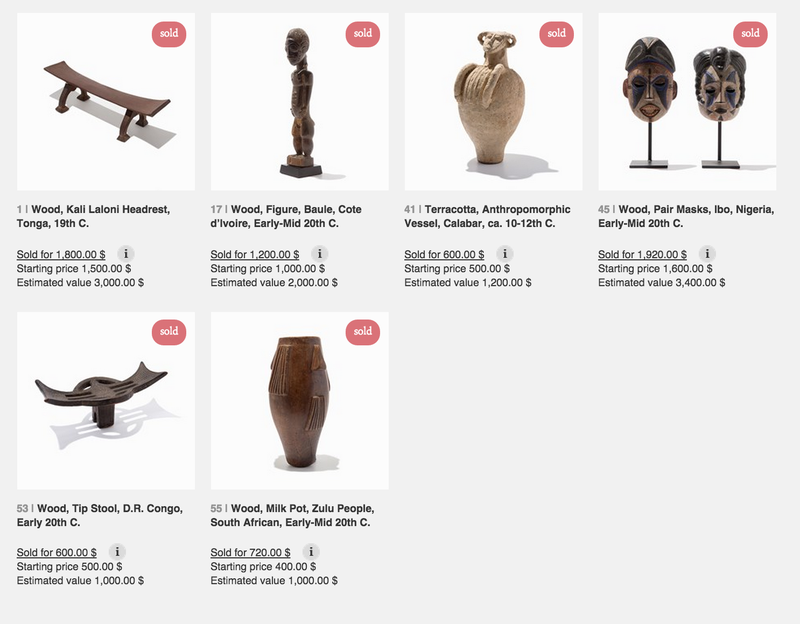 The website deceptively communicates "every item available to bid for on Auctionata or on sale is checked, valued and authenticated by our specialists and experts"? Auctionata AG undermines itself by stating it "values trust", but knowledgable collectors will immediately realize Auctionata sells buckets of afters, copies and doesn't even asterisk these lots STATING the GUARANTEE doesn't apply. Auctionata AG excludes guarantee coverage for lots where documentation is provided by non Auctionata employees. 11. Limited Liability: "Our liability is subject to the following terms, and as may be described elsewhere in these Conditions of Sale: (a) We agree to refund the Purchase Price in the circumstances explained in Section 12. In addition, and subject to the terms of this Section 11, the total liability of us and the Seller to you in connection with the sale of any Property shall be limited to the Purchase Price actually paid for the Property. Otherwise, we (including our officers, employees or agents) and the Seller are not responsible for: (i) the correctness of any statement of any kind concerning any Property, whether written or oral, (ii) any other errors or omissions in descriptions concerning any Property, whether written or oral." 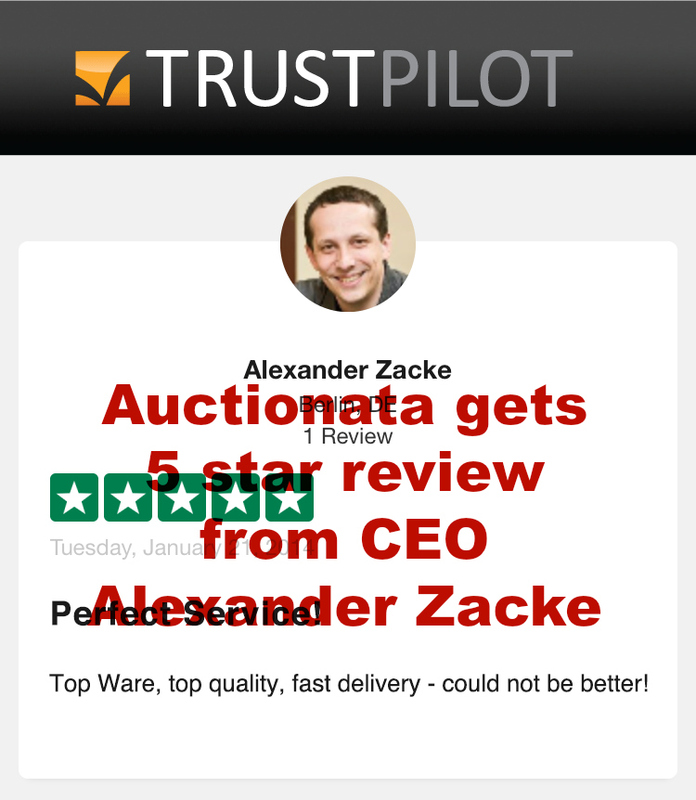 Alexander Zacke, CEO and Founder Auctionata, gave Auctionata its first 5 star review, on Trustpilot, one of 8 Auctionata reviews on Trustpilot. 3 Auctionata customers were less enthusiastic, awarding Auctionata 1 and 2 star reviews, including harsh warnings cautioning buyers to think twice before buying or bidding contrary to Auctionata's claim of exceptional service at each step of the consignment process. Doesn't Alexander Zacke realize Company reviews by employees are inappropriate, especially CEO's? Auctionata customer gives 1 star, inaccurate condition report; faulty iPad app. 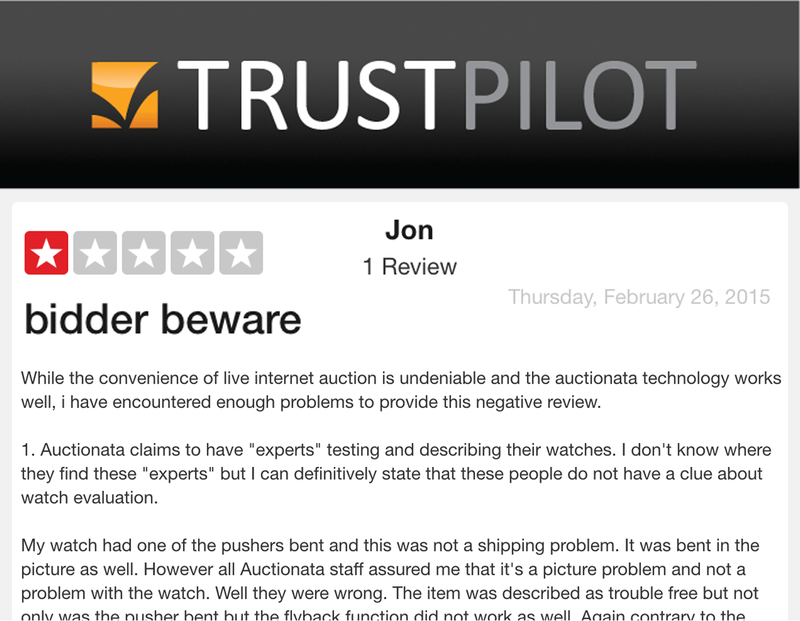 A second disappointed Auctionata customer also gave 1 star review on Trustpilot; 2/23/15, after receipt of a military watch; warning: "do not trust their condition reports"and said "they only provided a Eur 50 compensation" for the inaccurate condition report by the Auctionata "expert". Similar negative Auctionata customer reviews can be viewed at Yelp, Ripoffreport, Reseller Ratings. Clearly users have a problem with Auctionata's overall operations and its insufficient condition reports generated by the team of so called "experts", many of whom have entrepreneurial experience rather than supervisory/management auction and gallery experience. 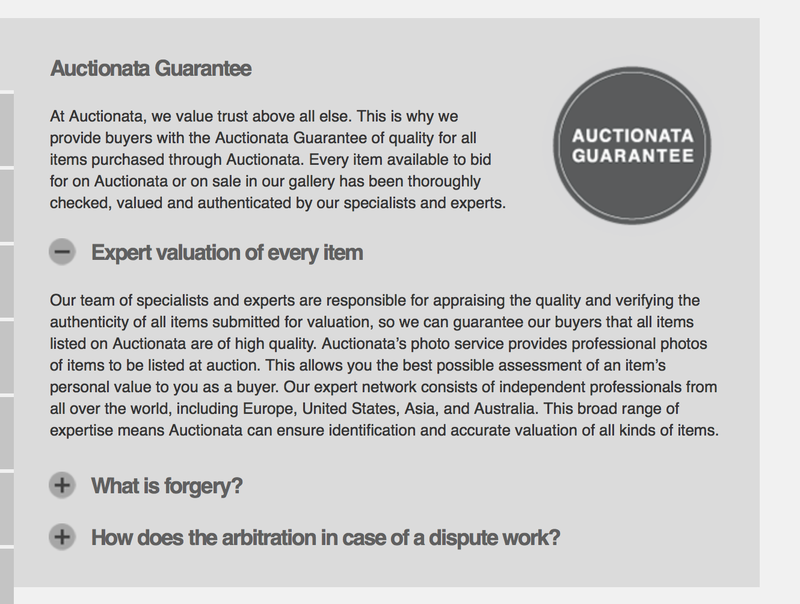 Why did Auctionata announce its 12/12/12 launch was 1st live Internet auction? 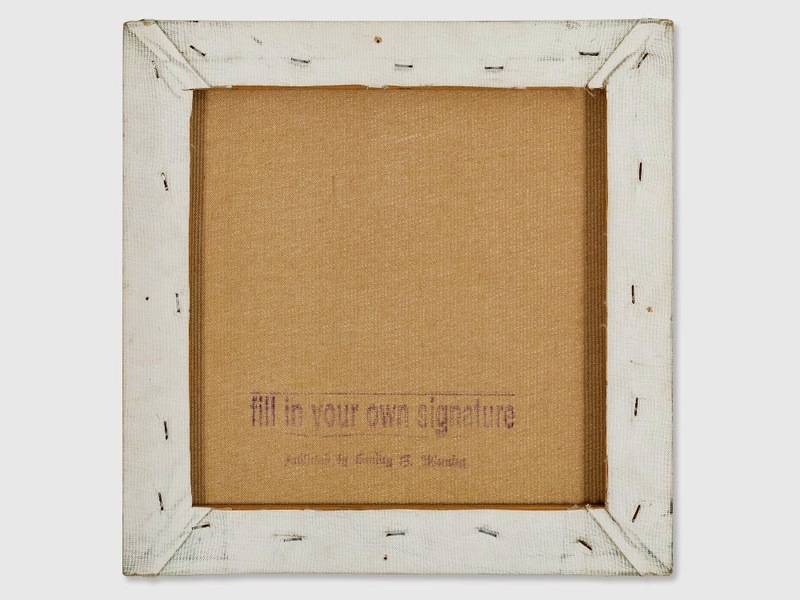 What about the thousands of preceding auctions broadcast by Live Auctioneers, Christie's LIVE, Sotheby's and Phillips? We are certain Alexander Zacke knows better; after all he boasts he was a Titanium Power Seller who allegedly achieved $10 million annual eBay sales. The technology that Auctionata uses is hardly groundbreaking; live streaming Auctionata auctions look clumsy; the auctioneers speak about lots in a language similar to shills on QVC, and NOT anything you would hear by auctioneers at Phillips, Christie's and Sotheby's. Let's face it, the Auctionata claim is FICTION; long before Auctionata launched on 12/12/12, Christie's LIVE enabled users to view, see and hear auctioneers auction lots offered in real time from sales rooms around the world. And long before the 2012 launch of Auctionata, Sotheby's had the same ability for viewers to view auctions anywhere on the Internet in real time too. Why isn't Auctionata Management scrupulous about selling quality online? Why do many Auctionata lots have sloppy documentation, erroneous comparisons and even counterfeits? A report in The New York Times confirms online buyers are worried "about provenance and authenticity" and indicates "the top end of the market is generally less suited to online sales”. International managing director Ben Hartley observes "online buyers feel comfortable up to about $10,000". Ben Hartley says he wants to provide "seamless user experience", yet Auctionata has failed to implement a proactive system to protect consumers from fraud, counterfeits, sloppy documentation, errors which are common in listings and erroneous comparisons? 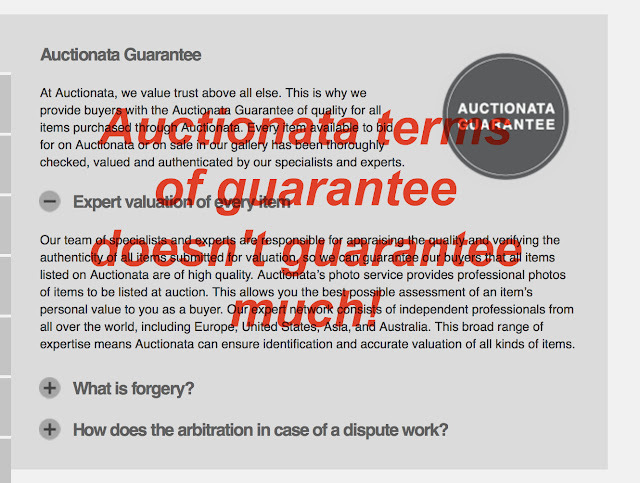 Auctionata condones sloppy documentation, erroneous comparisons, counterfeits too. For reference, International managing director Ben Hartley stated a vastly different point to Toovia, which we recommend you take with a grain of salt; "Our specialists vet and evaluate every piece sold at Auctionata.com and all purchases come with a 25 year guarantee".On this topic, Joseph K. Levene stated in The Fine Art Blog "The majority of lots offered for sale on Auctionata lack documentation clarity and include either vague support or no support. Too often lots sold exclude obvious information like date of sale; sale number; lot number; vague references to comparable sales results, lacking specificity/accuracy, many without links that art professionals and collectors understand and require." Why did Auctionata "Expert" state Arp sculpture in "good condition" when photographs indicate extensive pitting? Why didn't Auctionata "expert" disclose identical Arp, edition 3/5, was sold twice at Sotheby's? 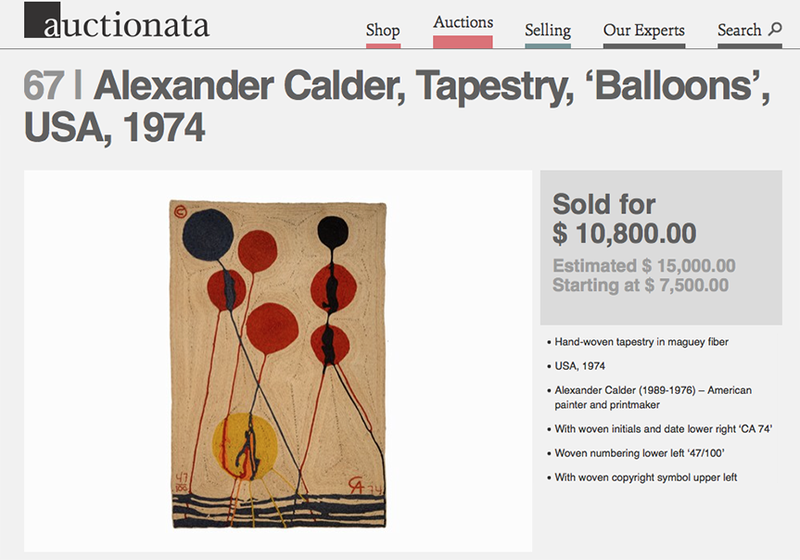 Why did Auctionata "Expert" misattribute Tapestry sold for $10.8K as an Alexander Calder even though Calder Foundation NEVER authorized and Alexander Calder NEVER created? Why did Auctionata"Expert" misattribute painting as an Andy Warhol even though NOT created or authorized by Andy Warhol. It is inconceivable that any Andy Warhol expert at Christie's, Sotheby's, Phillips, etc., would have permitted this obvious fake to be sold, especially with the bizarre fiction used by Auctionata at the time. There is no excuse for counterfeits, especially since Auctionata wants you to believe they are the premier auction house. Ben Hartley told Luxury Daily, "the initial valuation process can begin online, but authenticity is still a necessary in-person process". 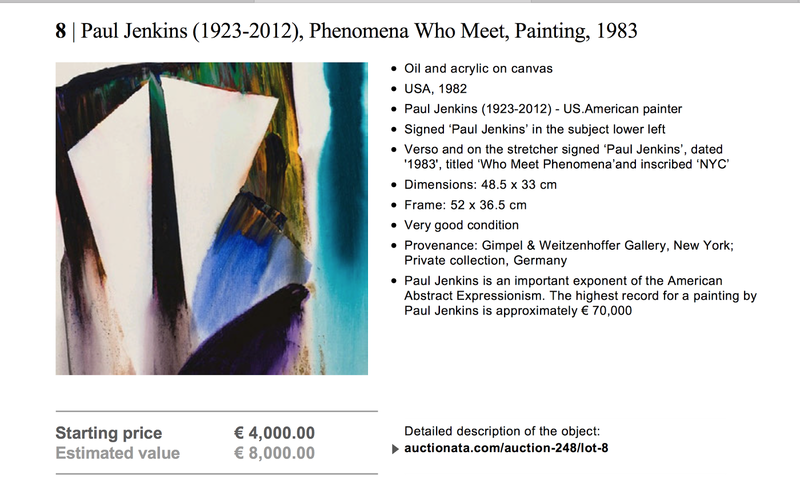 Why did Auctionata use irrelevant €70K comparable for small Paul Jenkins? Why did Auctionata Expert indicate erroneous €70K comparable for small Paul Jenkins painting? Contrary to Alexander Zacke's statement: "...We link our work with research found in international art databases." even though this is not implemented in any lot we have seen, including the Paul Jenkins seen above and Lesser Ury painting sold for €130,000, which included sloppy and misleading documentation, including an incorrect stipulation as follow: "comparable subjects fetch up to €180,000 on the international auction market'" even though the same painting was sold twice at auction before it was offered in 2014 at Auctionata; in 2009 for $92,855 and in 1995 for $87,470. 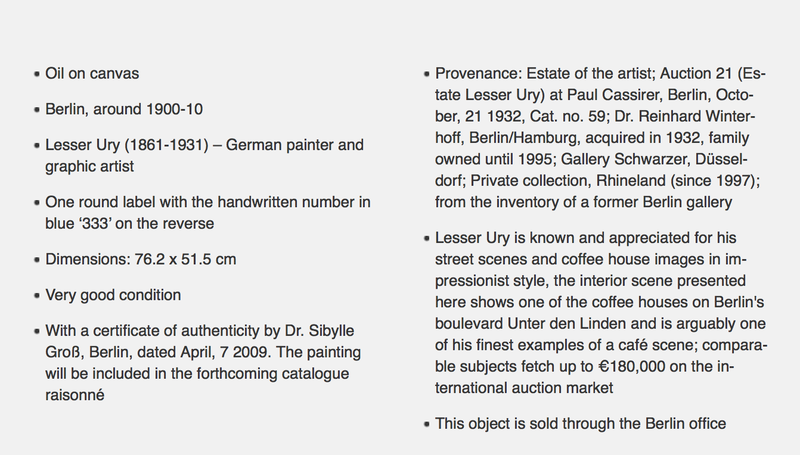 Why did Lesser Ury documentation fail to mention 2 prior auctions, fictional provenance & erroneous comparable? More disturbing, the Lesser Ury documentation included provenance details factually incorrect; two auction sales were NOT acknowledged; in an act of fiction, Auctionata stated the painting was in the same Private Collection since 1997, even though the painting was sold in a 2009 auction. We can assure you Christie's and Sotheby's would NOT tolerate similar sloppiness from any Specialist; furthermore, this error was acknowledged by Joseph K. Levene in The Fine Art Blog, yet Auctionata has failed to make a correction. 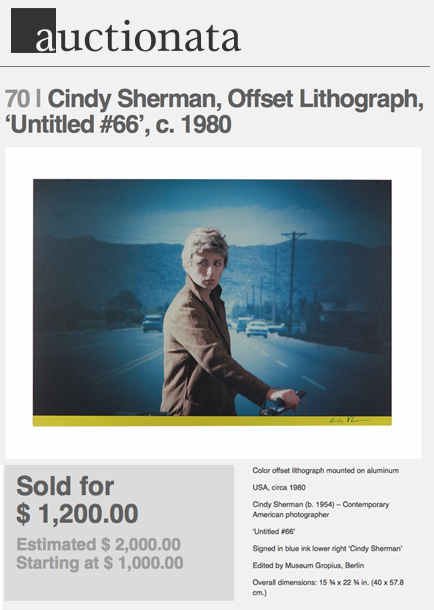 Why did Auctionata expert misattribute cut down 2007 poster as 1980 Cindy Sherman? 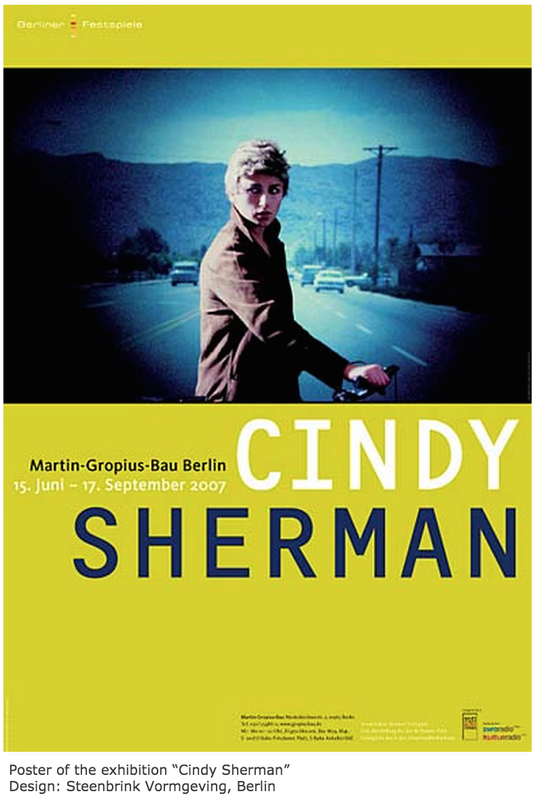 Auctionata "expert" misattributes 2007 Cindy Sherman poster sold for $1,200 as a circa 1980 offset lithograph when in fact, the lot is 2007 trimmed poster attached to metal. Why would a "Photography expert" make such a mistake? Has the so called "Photography expert" been fired? Has Auctionata informed the buyer and offered a refund? Auctionata erroneously claims to be global leader in online sales, when facts show otherwise. 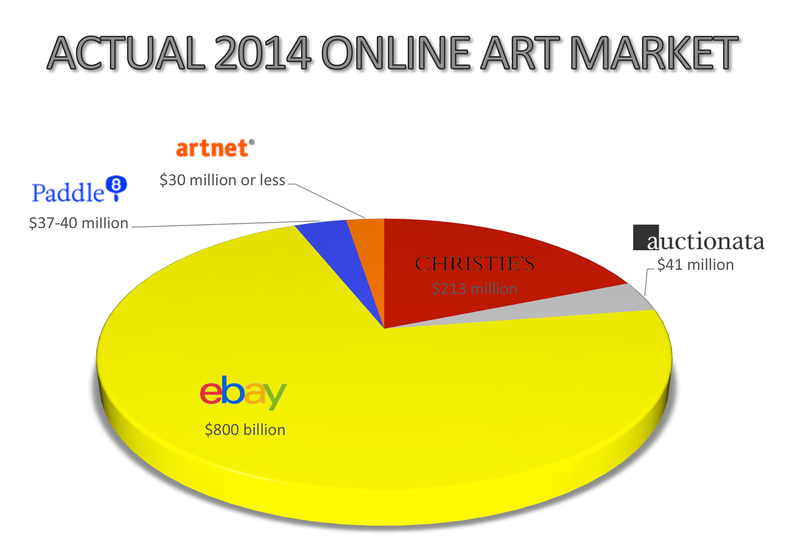 Skates issued a February 2015 analysis which overlooked at least $1 billion Online Art volume at eBay and Christie's. Auctionata wouldn't make third place after factoring the $1 billion Skates overlooked along with analysis of Auctionata's top selling lots, only 11 of top 33 lots sold lots were art, and you quickly realize the Skates analysis is deeply flawed. 8 lots sold priced over €91,000 were cars. 4 lots sold over €91,000 antiques. Auctionata deceptively erases 44 unsold photography lots in 2/26/15 Auction. 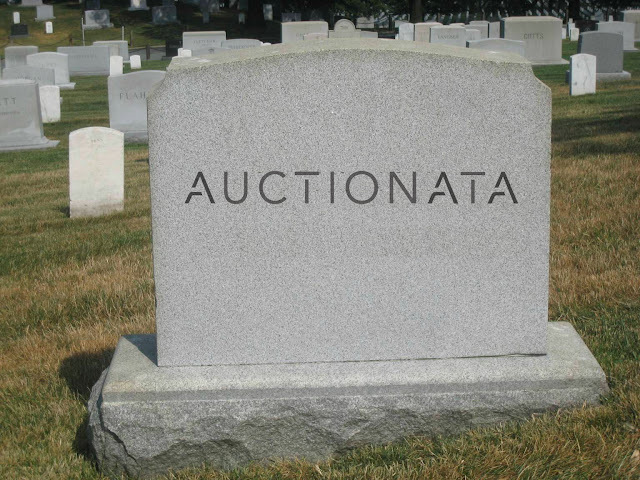 Removing Unsold lots for LACK of transparency is routine at Auctionata; that way Auctionata just emphasizes sold lots and sidesteps its particularly high UNSOLD lot rates. Unfortunately, the Auctionata website editor failed to get that memo as all Auctions continue to state "See All Objects", but you can't. Click all you like and you will ONLY see the lots sold. For a solution; visit Live Auctioneers and you can see everything, both sold and sometimes unsold as too often, the unsold lots are also appear sold, even though they aren't. Sometimes Auctionata even leaves a PDF catalogue of the respective sale. Although the Auctionata website doesn't enable segregation of unsold lots, Live Auctioneers does. Since Auctionata launched New York auctions on 10/23/14, 1839 lots have been offered in New York auctions with 58.8% lots unsold according to Live Auctioneers. 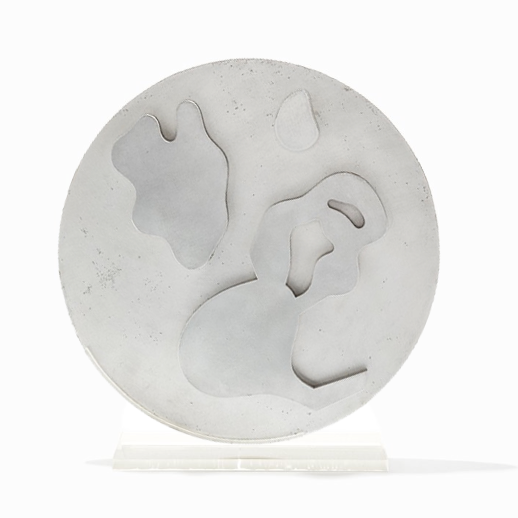 This contrasts with the overall 2014 unsold lot rate of 41.2% for Auctionata during 2014. Poor results to date in New York demonstrate Auctionata is seriously hemorrhaging investment funds without being close to profitable given the multi-million dollar price tag of its 5,000 foot New York TV studio. 51% of sold lots in New York are under $2,000. Contrary to Alexander Zacke's statement, recent results indicate Auctionata's New York expansion has failed to gain traction, and requires immediate steps to improve quality and halt sales of inferior lots and counterfeits. Auctionata investors should question the wasteful decision to build a New York TV studio that could have been established more efficiently outside New York City; after all, there is NO live studio audience so why waste funds on a studio no one visits. Hyperbole goes unchecked; Jewelry specialist Katherine Palmiter incredulously states "Whether a collector, investor or stylist, a range of people found great items that will not be seen again any time soon at accessible prices." Is something about to happen to low priced jewelry that no one else knows about? Analysis of Auctionata revenue to date indicates that aside from auctions of Watches & Cars, Auctionata is far from a rousing success. Auctionata may boast rhetoric about growth, revenue, trust and having the largest network of renowned experts; sadly, this marketing charade does not excuse widespread documentation errors/omissions that saddle the website. Most likely, this is a significant concern that prevents serious collectors from buying/selling at Auctionata. Under the current circumstances, we would NOT recommend buying or selling at Auctionata, given the risks of inaccurate lot details or worse, buying a counterfeit. In our opinion, we believe it is essential to only buy Online where there is NO doubt as to authenticity. The element of doubt at Auctionata is not worth the risk especially since the 25 Year Guarantee has so many loopholes. Major estates like the Estate of Andy Warhol, Keith Haring, Roy Lichtenstein, Jean-Michel Basquiat, etc. do NOT provide ANY authentication, so collectors should be especially careful to NOT take unnecessary risk and purchase items that have sketchy provenance or questionable documentation.